To view this map on this page, use sliders or fingers. For airport information, visit Paris airport connections . This map only shows the central area of Paris. It includes the principal tourist attractions. 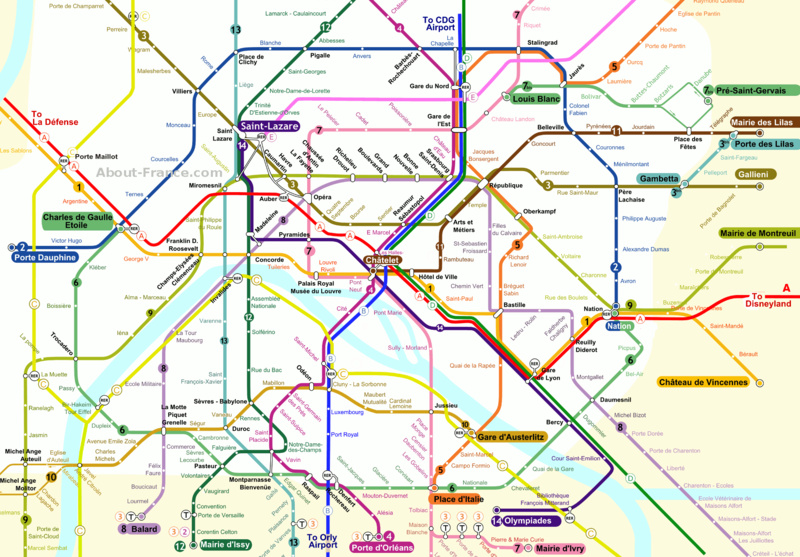 letters A to E represent the Paris rapid transitlines, the "R.E.R." Click the link, then print the map. Select "landscape" mode for the paper setting. Centre Pompidou: Metro line 11 - Rambuteau (or several metro and RER lines: Châtelet). The map on this page is adapted by About-France.com from an original by Rigil. Published under the GNU free documentation licence. The Paris City pass is the cheapest of the full Paris visitor passes - up to 24% cheaper than other passes for adults, and up to 50% cheaper for children. Prices start at just 19,90 Euros for a two day pass for children and 99.90 Euros for a two day adult pass.